I received an invitation from Eric through e-mail last night regarding this event to be held in Boracay on April 30 and May I, 2009 at Mandarin Hotel. 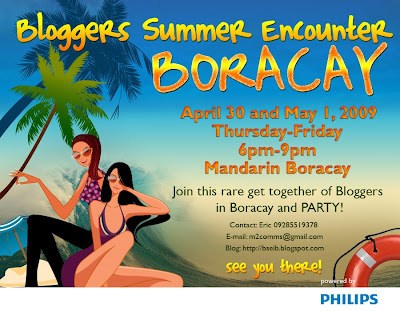 Philips will be hosting the B.S.E Bloggers Summer Encounter in Boracay. Unfortunately I won't be able to attend the said event. For bloggers who are interested to join, you may visit this site. wow! i didnt know about this. too late i should have been there.